A few months after Warner Brothers released The Strange Case of Dr Rx, they gave audiences a better murder-mystery programmer with The Hidden Hand (1942), aided by dense Agatha Christie-style plotting and an elaborate game being played by its protagonist that lets the viewer in on the fun from the start. The 1934 stage play source Invitation to a Murder by Rufus King hints at the playful tone intended, and under director Benjamin Stoloff the workmanlike cast facilitate the step-by-step machinations without any distractingly bad performances cluttering its path. Indeed, the film creates a good showcase for the eerie screen persona of Milton Parsons, a busy character actor of cadaverous build, eccentric manner and a beguilingly soothing voice reminiscent of Boris Karloff. Here, he plays escaped convict John Channing who returns to the family home assisted in his break-out by his sister Lorinda (Cecil Cunningham) who wants him to help her in a ruthless plan to test her avaricious relatives. She knows the unfeeling bunch are circling for her inheritance, so she has John pose as her butler while setting off a chain of events designed to have them cross and double-cross each other under her remote puppetry. The two greedy couples are Walter and Rita (Roland Drew and Julie Bishop) plus Horace and Estelle (Tom Stevenson and Ruth Ford). Coincidentally, Ford was herself embroiled in a real-life familial inheritance squabble over the estate of her wealthy mother-in-law. By the time of her own death at 98 in 2009, Ford had amassed a personal wealth of ten million dollars and bequeathed the whole estate to her butler, snubbing her daughter and grand-children. To balance the unapologetic avarice within her family, there is the goodness of Mary Winfield, Lorinda’s secretary, whom she intends to make her beneficiary, owing to her selfless loyalty and being the daughter of a past almost-husband of Lorinda. Mary’s similarly virtuous fiancé is also Lorinda’s attorney Peter Thorne played by Craig Stevens who later achieved TV fame as private eye Peter Gunn. Together they embody almost the only wholesome characters in the film, other than Willie Best’s chauffeur Eustis, another in his dispiriting gallery of cowardly comic relief subservient black employees, last seen in my review of The Strange Case of Dr Rx. Eustis may also be on hand to represent an everyman fear reaction to the murders and menace since the grasping family members are too greedy to ever be scared by the unfolding horror. To crank up the greed incentive amongst her clan, Lorinda drops in various clues and temptations. John leaves a paper on the stairs to be found by their Chinese cook Mallo (Kam Tong) describing the combination of the clock hands needed to release the key to a treasure chest Lorinda has secreted in the house. 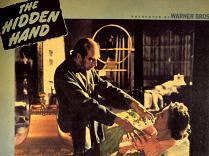 She also enlists her corrupt doctor nephew Lawrence (Frank Wilcox) to drug her with a suspended animation serum and provide a full burial ceremony before reviving her with an antidote, in return for a quarter of her estate. Having wound up the mechanism, Lorinda’s macabre mind relishes the impending feeding frenzy: “You know, it gives me a thrill to know I’m going to die tonight”. The thread of Channing insanity clearly doesn’t just run through the male line. Along the way to Lorinda’s staged death, she fakes nearly becoming victim to a falling plant-pot and has her beloved raven Mr Poe poisoned (a little name-check for writer Edgar Allen Poe’s titular haunting bird). After she is apparently killed the same way, Lawrence opts to let his aunt stay dead since he benefits anyway, not realising she was testing him as well. The crafty matriarch seems to have considered every eventuality – except for John’s coveting of Mary. “So lovely, so delicate, so dainty” he drools. A recorded disc of Lorinda reading out her will allocation then causes the relatives to form an uneasy alliance in pursuit of the remaining quarter of her inheritance. The pacing increases and a body count is entertainingly racked up: the nurse is strangled by John and Mallo becomes the first victim of a trap-door activated by the clock combination that sends each one plummeting into the flowing river under the house. The bulldog-faced cops arrive as Lorinda emerges not only as a frighteningly effective planner but also a capable murderess in person, shooting her traitorous nephew in cold blood. She is undone though by the weakness of her genuine care for Mary, which forces her to reveal she is still alive when Mary almost triggers the trap-door to her own doom. It’s hard to argue with her defence to the cops that “…all I did was rid the world of a few abnormals”, even though she is evidently a pretty lethal one herself. 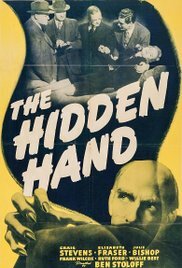 The Hidden Hand is a spirited B-movie of undemanding fun that wears its scheming silliness with confidence.